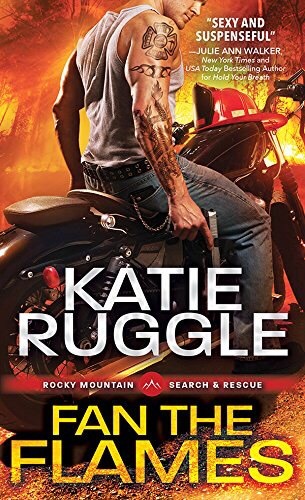 I read and reviewed Katie Ruggle’s first book in the Search and Rescue series, Hold Your Breath, giving that book ❤️❤️❤️❤️❤️. Fan the Flames only cemented my love for Katie Ruggle’s style of writing. Again, don’t let the cover fool you. Yes, Ian Walsh, nicknamed Beauty by his fellow firefighters, is gorgeous. But, he is a character with many layers, and the author, through the eyes of Rory, gives us all of those layers to unwrap. Rory is unlike any female romantic protagonist I have read. She is socially awkward, raised in a bunker underneath their gun shop by parents who were paranoid of everyone and everything. Rory, now alone, runs the gun shop out in the middle of nowhere. She sells some guns illegally out of a back room, and when the local biker gang Ian rides with decides to hold up her store, Ian chooses sides… her’s. The interaction between Ian and is causes all sorts of problems, bringing Ian and Rory closer together. Rory is hilarious. Even though Ian has known her since they were kids, he doesn’t realize how sheltered she has actually lived. Her interpretations of people’s, and Ian’s, actions provide some comic relief. Her innocence also gives him a reason to get all protective alpha on her, even though she is more knowledgeable about firearms than he, and in fact, defends herself really well. As he brings her out into town life, she realizes that she isn’t as alone as she had thought. She actually has a whole town of friends who will stand by her, and, well, of course she has Ian too. Isn’t it fun when you discover a new author, and as you keep reading their writing just gets better, and strikes a chord? That is how I feel about Katie Ruggle. She is new, she writes extremely well, and hopefully she has lots of stories to tell, because I will run to the store and buy her books. You should too.